Indoor rock climbing is a fun and kid-friendly sport. Kids love the sense of accomplishment when conquering a vertical wall — and all the problem-solving and focus it takes to get there is great for their self-esteem, too. The best way to taste-test climbing with kids is to try a drop-in session at an area climbing gym—ideally, one that’s super beginner-friendly and family-friendly like Hub Climbing, with locations in Mississauga and Markham. 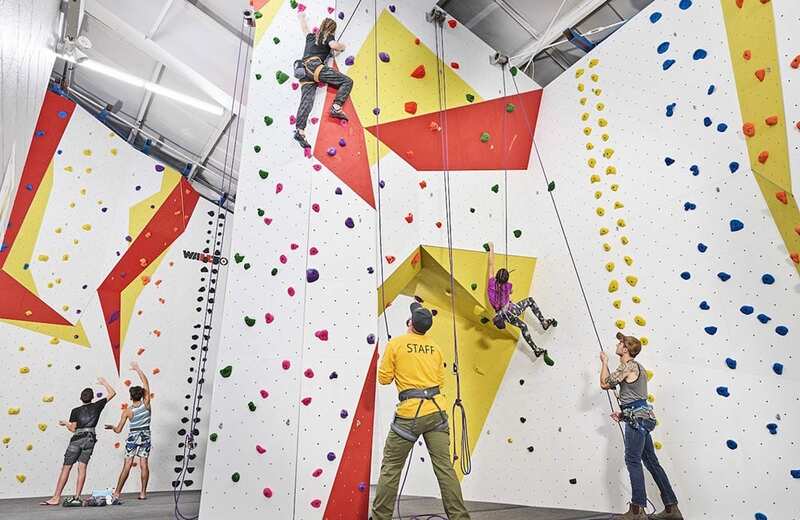 Opened in February 2019, Hub Climbing Mississauga is the largest climbing gym in Canada at more than 30,000 square feet! The veteran Markham facility has been around since 2014. 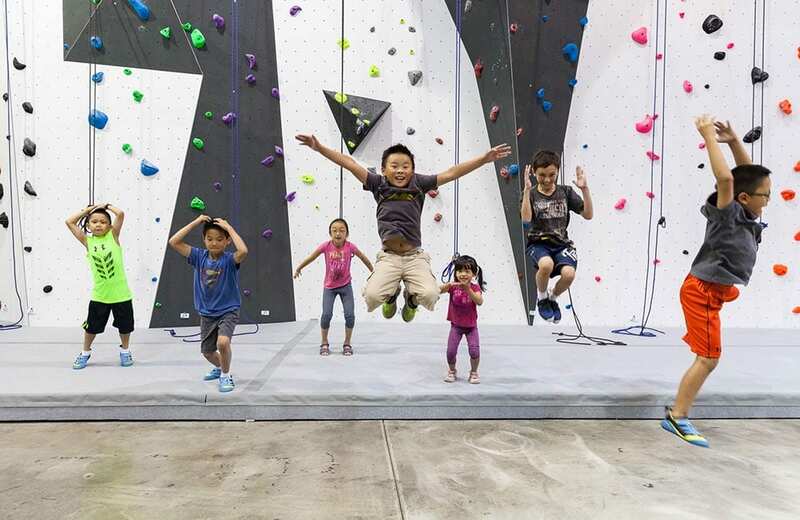 Both facilities are world-class climbing gyms with bouldering and rope climbing, drop-in climbing, summer camps, and birthday parties for kids. Hub Climbing’s gyms are designed with the philosophy that climbing is for everyone, from beginners all the way to Olympians, and the staff is trained to make beginners feel welcome, which makes it a great choice for anyone at any level who wants to experience exceptional indoor climbing facilities. Even 98-year-old former Mississauga mayor Hazel McCallion did her first-ever climb here! Climbing and bouldering are activities families can do together all year-round. It is very much hands-on for both kids and parents (literally, if you’re belaying your child!) and it’s a great bonding experience. Climbing is also a healthy sport that helps kids build confidence, strength, and focus and push their own limits. And here in the Toronto area, we can’t get enough of fun, indoor options like this, to keep our kids moving during the cold months, on rainy days, and on too-hot days in the summer! A great way to dip a toe into climbing with kids is to take advantage of gyms that have drop-in climbing and kid-friendly policies like Hub Climbing in Mississauga and Markham. At Hub Climbing, kids as young as age 4 who weigh at least 30 lbs can climb with an adult and kids as young as age 6 can try bouldering. It’s totally easy for beginners (adults and kids) to drop in and get started climbing right away. No reservations or advance notice are required and harness and shoe rentals are available. When you arrive, you buy a day pass, then the staff will give you a 20-minute orientation of the equipment and the different areas of the gym. Unlike per-hour recreational facilities, the day pass allows you in-and-out privileges. You can leave for lunch, for example, and come back anytime before closing. In the ropes climbing area, there are 30 autobelays that make it easy for anyone to get started without any prior experience. An autobelay is a device that secures the climber via a retractable cable that lowers you to the ground at a controlled rate, removing the need for a human to hold a rope on the ground (belaying), which takes a bit of skill to learn. Autobelays are great for a first visit, but Hub loves to teach parents how to belay their children, too. This means you are holding the rope tethered to your child as he or she climbs. It creates an amazing bond between you and your child as you coach, give feedback, and champion your child to get to the top. The bouldering area is a series of low walls you climb on without the use of harnesses or ropes. It’s a bit more challenging than beginner climbing—and you will definitely fall—but it’s still lots of fun for kids and grown-ups. Since it’s a bit harder than climbing, kids should be at least 6 years old for bouldering. It’s worth noting that kids must have an adult actively supervising them at all times (no more than two kids per adult). So you should expect to be right alongside your child as they climb to lend help and cheer them on. Indoor climbing birthday parties are awesome because they completely take care of the activity portion of the party, they keep kids moving, and they work for any season. It’s also an opportunity to introduce kids to an activity they can learn and grow with later if they absolutely love it. Plus, at a facility like Hub Climbing, you have the peace of mind of knowing the kids are under the supervision of highly trained staff (all with climbing instructor certifications from the Climbing Wall Association) at a 5:1 ratio and are climbing on state-of-the-art equipment. Never heard of augmented reality (AR) climbing? Neither had we! 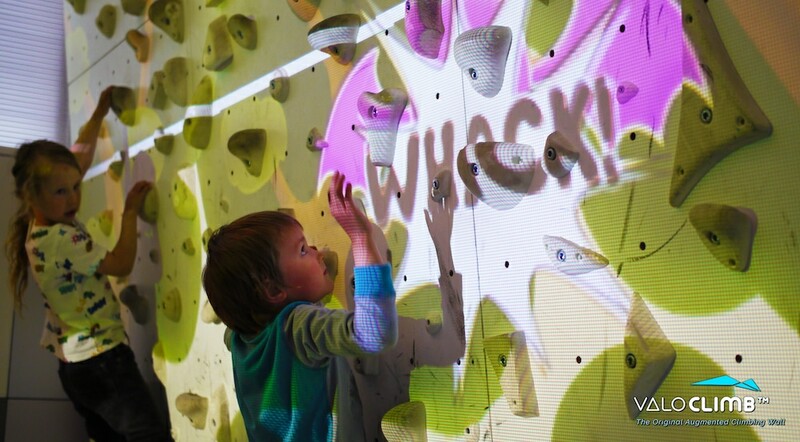 AR climbing combines video game technology with climbing, but there’s no sitting around involved—it’s very much active climbing, enhanced by interactive games involving a projector and motion tracking technology. In one game, called Whack-a-Bat, you navigate the wall in every direction to “whack” the virtual bat with your foot or hand every time it appears. The game gets progressively harder until you win…or fall onto the mat! 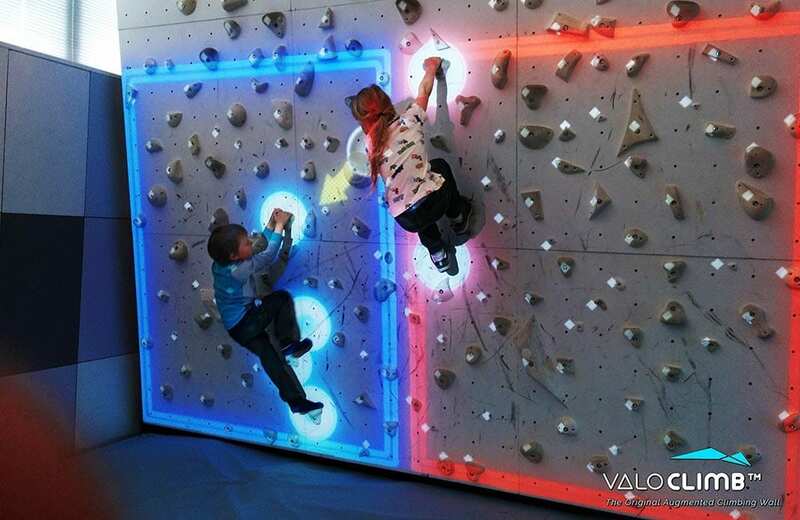 AR wall designer Valo Motion claims that Whack-a-Bat “keeps kids entertained for hours (yes, we have seen that)”! There are also two-player games, like Climball, where players climb side-by-side in either competitive or collaborative mode to play a sort of vertical air hockey. Hub Climbing is one of the few places you can experience AR climbing in the Toronto area—at both its Mississauga and Markham locations. And yes, you can book the augmented reality wall for birthday parties! Ready to start climbing with your kids? Learn more about Hub Climbing Mississauga or Markham, including climbing camps, climbing lessons, and youth climbing recreational teams.